I selected three tree images to work with – a palm tree, a wind bent coastal tree and a gnarled leafless oak. 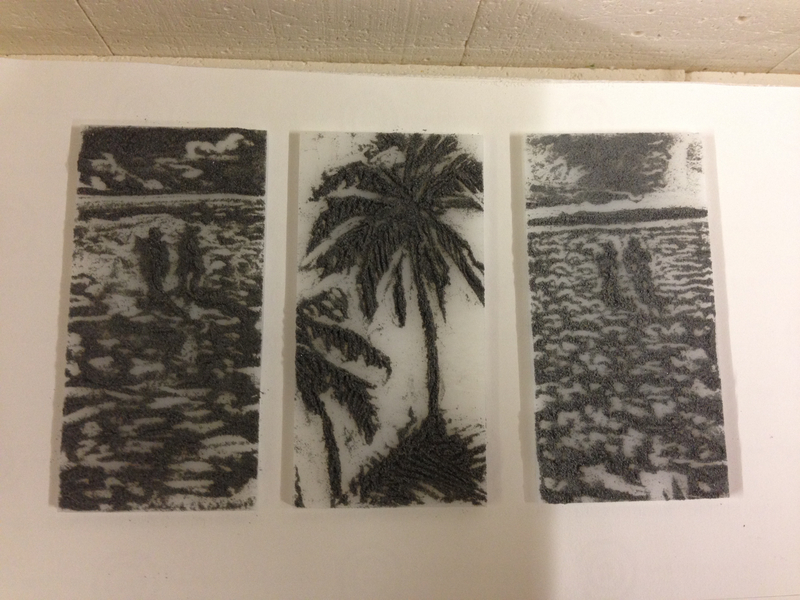 I started with the palm tree as it seemed most amenable to working with a card as the drawing tool as well as being a shape where precision mattered. 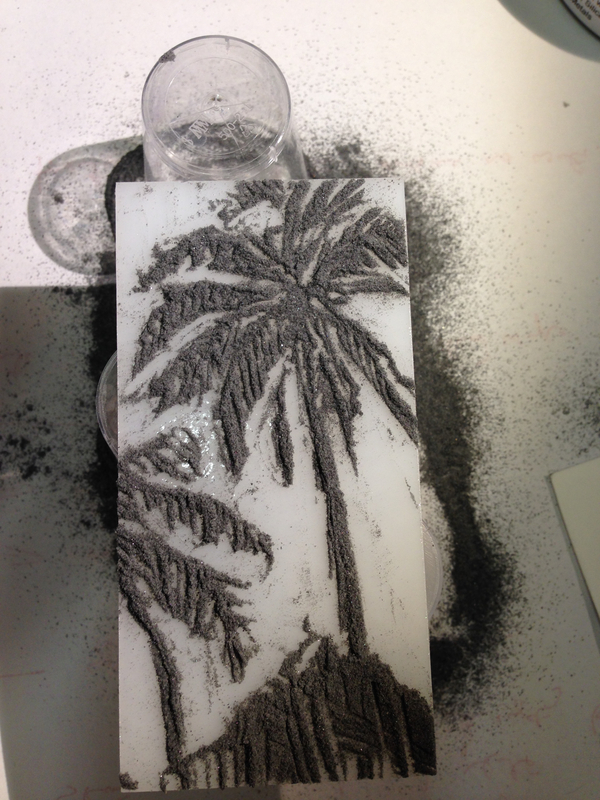 I sifted the black powder on the glass, set to with a bit of card (not actually a business card as forgot to take one out to the studio), and produced a passable palm tree. A bit of tidying up with other tools would have made this neater perhaps, but I like the look of it. 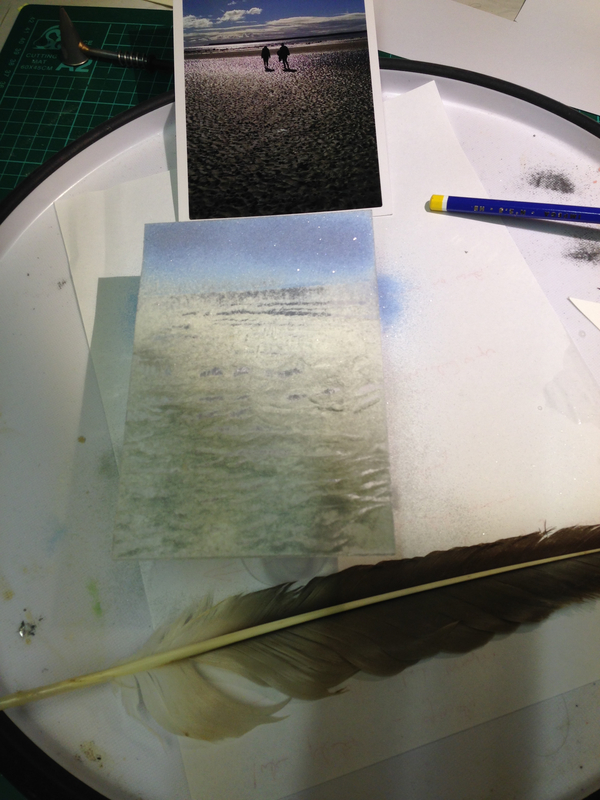 I then decided to redo yesterday’s image with the card to see the difference. I thought it would be a lot easier than just working with my fingers, but I don’t think it was. After these two were snuggly resting in the kiln next to day one’s piece I decided to do two colour images, just to extend the practise and because I had got the studio to a reasonable working temperature. 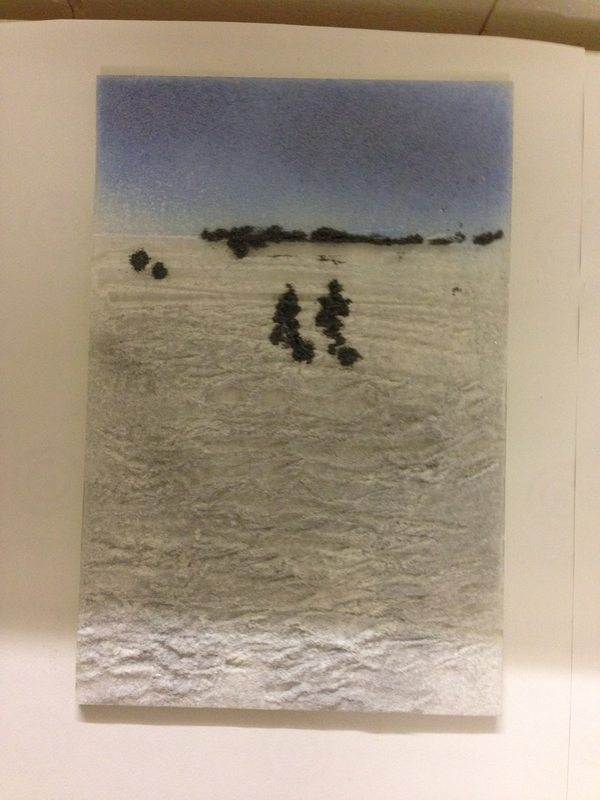 I repeated of the twilight beach with coloured powder on transparent glass- postcard sized, 15x10cm- which would be much better done as a firing of the base colours and then adding the people afterwards. I managed to open all the jars of frit that I tried to open. The hardest thing was loading the little sieve- a tea strainer where you compress the handle to open the sieve and load powder in with a teaspoon. That was very tricky to manage with my injured wrist. I used a feather to get the sand ripples- looks good at this stage but I suspect the pattern will pretty much vanish when fired. 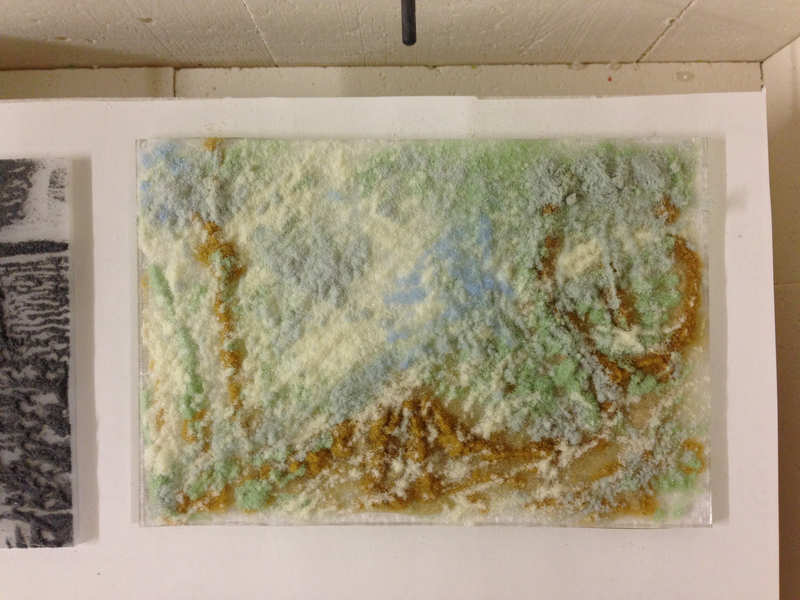 A key piece of learning when doing this picture was that one should remove the hanging label from the sieve before working carefully on a two colour image…I got some dings in my fresh expanse of colour from the cardboard catching in the powder. The other colour image was based on a spring woodland image I had lying around the studio- a painting I had done about twenty five years ago. I started with wet powder, but soon lost any sense of achievement and I have no idea what this will look like when fired. The key thing is to get me back into using tools and working small with some precision. 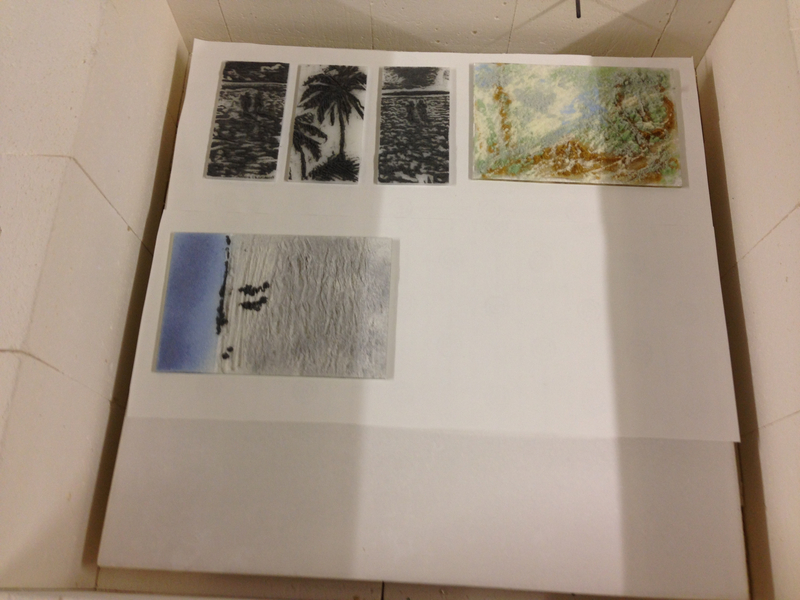 So, the kiln is filling up, I’m getting some dexterity and imagining practise, and there is still room in the kiln for another couple of days work.